Catacombs of St. Callixtus, Rome. 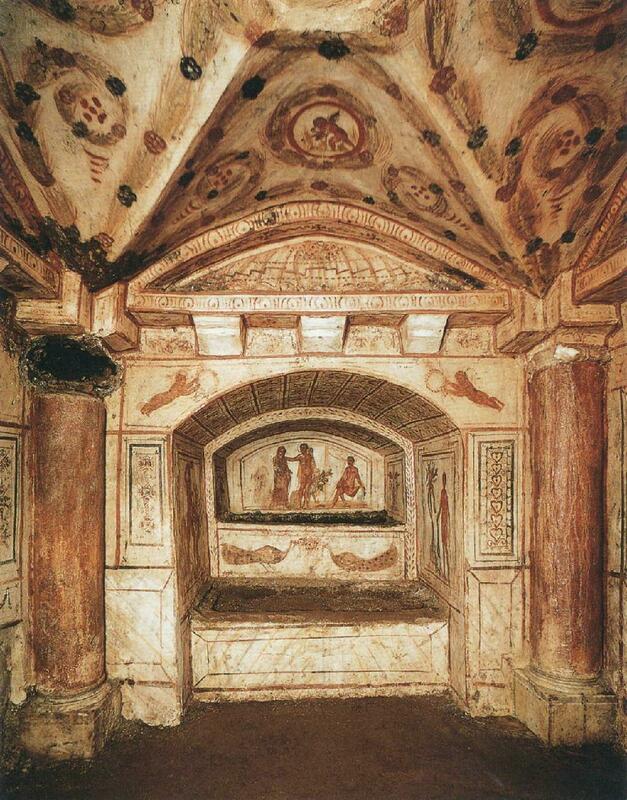 In addition to the tunnels with loculi hewn from the tufa, there are also more elaborate carved and painted chambers or cubicula that held wealthy families, like this one from the Via Latina Catacombs with pagan imagery. 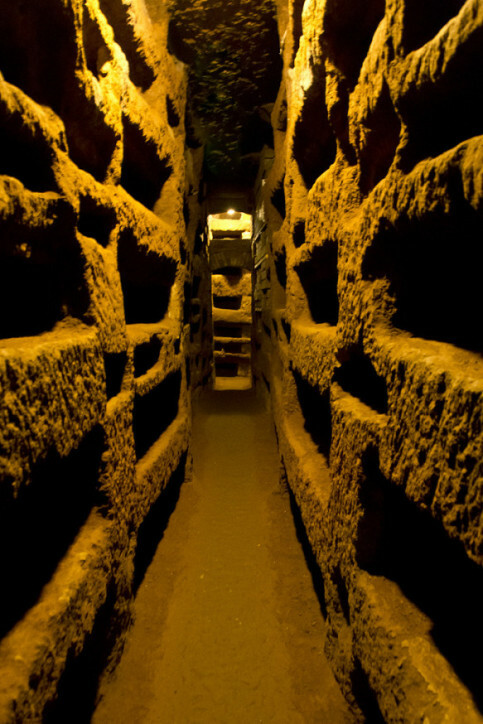 Cubiculum, Via Latina Catacombs, Rome. 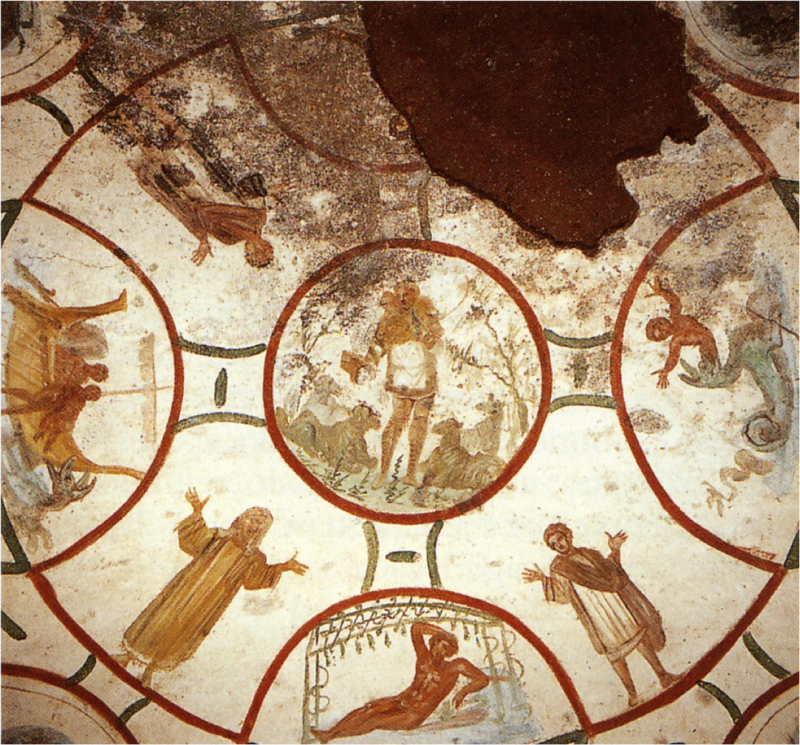 In a cubicula in the Catacombs of Saints Peter and Marcellinus (below), the Good Shepherd is painted in the center of the domed ceiling. He holds a lamb on his shoulders and two sheep lie at his feet, symbolizing the souls that Christ will gather to himself. The lunettes surrounding the Good Shepherd contain episodes from the story of Jonah, whose three days in the belly of the whale were likened to Christ’s resurrection on the third day. The figures with raised hands are in the common orant pose of worship in the ancient world. 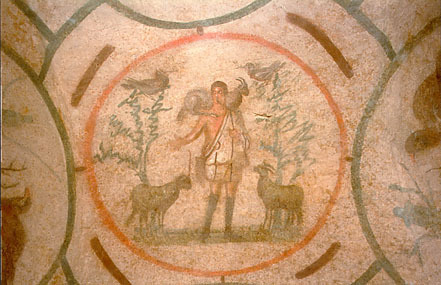 Good Shepherd with scenes from Old Testament story of Jonah, early 4th c., Catacomb of Saints Peter and Marcellinus. If you’re unable to visit Rome to see the catacombs, you can take a Google maps tour of the Catacombs of Priscilla or an online guided tour of the Vatican necropolis. 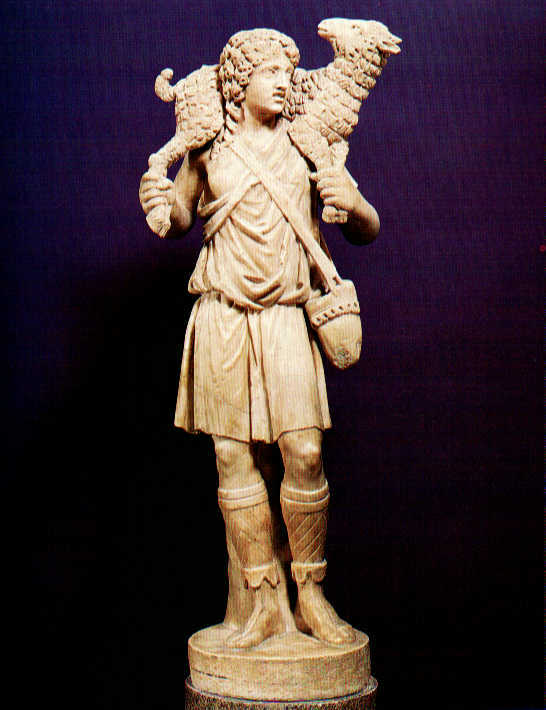 The Good Shepherd was also a popular image in sculpture for the early Christians, as the example below from the Vatican Museums demonstrates. From about the fifth century the Good Shepherd image seems to have been replaced by other representations of Jesus as teacher or Pantocrator. One of the last examples of the Good Shepherd is this marvelous mosaic from a royal mausoleum in Ravenna, Italy, with Jesus looking rather more regal than in prior images. 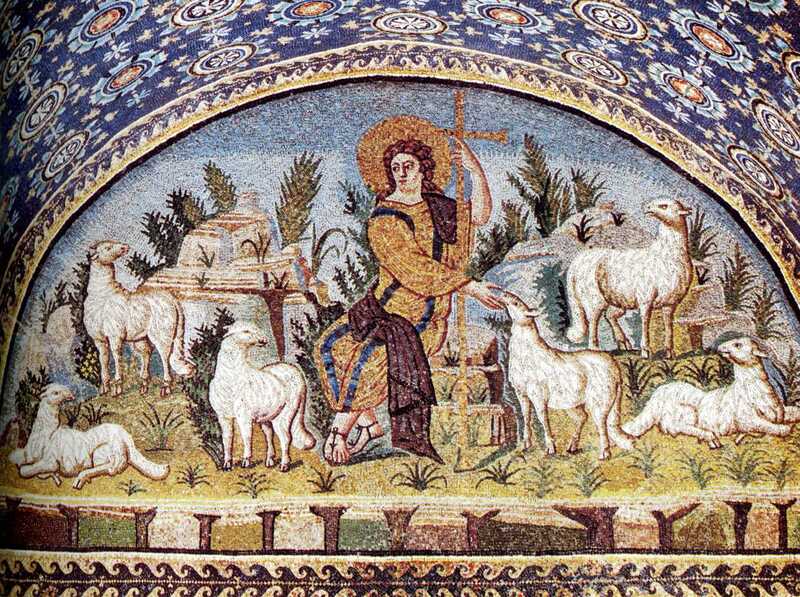 Jesus as the Good Shepherd, mosaic, 5th c. Galla Placidia Mausoleum, Ravenna, Italy. Scholars believe that the Good Shepherd symbol may have been a pagan motif adopted by Christians, as they also adopted signs such as the fish, anchor, and dove. The figure of a youth bearing an animal on his shoulders was known since at least the sixth century B.C. and may have represented a sacrificial offering to Greeks and the idyllic rustic life to Romans. The connection of the shepherd with the Bible was a natural one, though, since the motif was common throughout both Old and New Testaments. Indeed, my Bible concordance lists 137 uses of the word shepherd and its variants. References to God as the shepherd who watches over his people begin in Gen. 48:15, where the elderly Jacob/Israel says that God has been his shepherd all his life. They culminate in Rev. 7:17, when the multitude stands before the throne of God in a land where the Lamb will be their shepherd, leading them to springs of living water where God will wipe away every tear. Perhaps the most beloved of the Psalms, Psalm 23, best expresses the longing for God as Good Shepherd. I have copied it below as it appears in the lectionary so that, if you choose to, you can repeat the response (in bold) each time as you would in church. Try to place yourself in the setting, with the sound of birds, sheep baah-ing, a peaceful stream babbling, the sun’s warmth upon you, and the security of knowing that, no matter what happens, you are beloved and safe in His care. Truly imagine what it would be like to be in the presence of our Good Shepherd. This entry was posted in Art, Bible, Faith, Religion and tagged art, art history, Bible, catacombs, Catholic, Christian, contemplation, faith, Good Shepherd, meditation, Psalm 23, scripture. The reading today is Good Shepherd passage so let’s look at that imagery from ancient times.